The XP59 Airacomet project was launched by USAF Major General Henry (Hap), Arnold on the 5th September 1941 began when he approached Bell Aircraft and asked them to build a new fighter based around the GE-1, a license made Whittle W2/B engine. The contract was signed on the 30th September with a deadline of eight months to produce the first of three prototypes designated XP-59A's. The Bell designers adopted a conventional approach which resulted in a preliminary design in just two months. This was approved and construction of the first prototype started which was shipped to Muroc Dry Lake (Now Edwards Air Force base) on the 12th September 1942 for ground tests. The engines called GE-1's were built at the same time by General Electric and had an initial thrust of 1,250 lbs. This meant that two engines were required and in the Airacomet these were mounted side by side in the fuselage. After being trucked out to Muroc Dry Lake, California, draped in tarpaulin with a fake propeller attached, the Airacomet was first flown on the 1st October 1942 by Robert M. Stanley, chief test pilot for Bell aircraft, although the official first flight was recorded as the 2nd of October. The Airacomet was kept secret and it was only announced to the public in 1943. Named Airacomet, 13 development YP-59A aircraft followed during 1943-4 with the more powerful General Electric 1-16 (131) turbojet, and these were used primarily to provide basic flight data on turbojets. Production orders for 20 P-59A aircraft with J31-GE-3 engines and 80 P-59B aircralt with J31-GE-5 engines were awarded but, as a result of successful development of the Lockheed P-80 Shooting Star the last 50 of the latter were cancelled as superfluous, All production had been completed by the end of the war and many of the aircraft were issued to a special USAAF unit, the 412th Fighter Group, for use as drones or drone controllers, some aircraft having a second open cockpit in the nose for an observer. No P-59 ever achieved operational status, being found to lack adequate performance. One XP-59A, a trade for a Gloster Meteor flown by the USAAF, was evaluated briefly by the RAF at Farnborough and wore British markings. 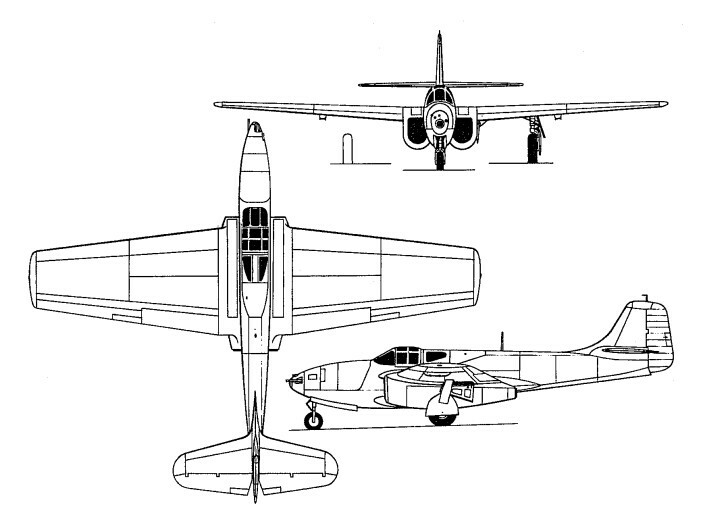 Three more were flown by the US Navy under the designation XF2L-1. Engines: 2 x General Electric I-A turbojet engines generating 2,800lbs of thrust each.